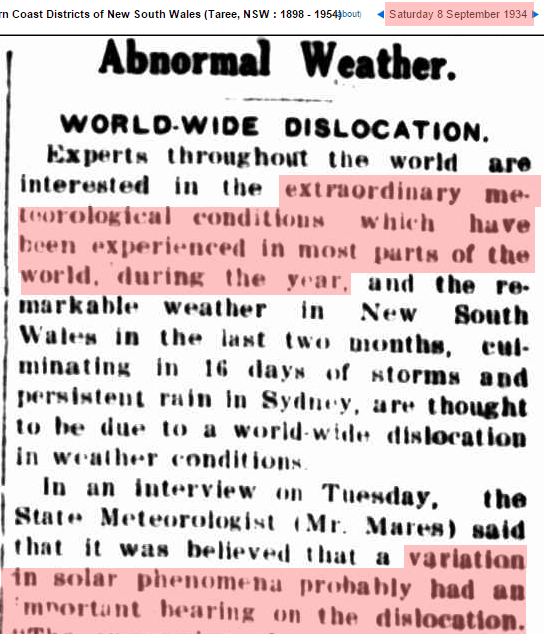 In 1934, there was “climate disruption” and drought across the planet. 12 Jun 1934 – WORLD-WIDE DROUGHT. Instead of blaming humans like the current crop of brainless climate scientists do, scientists at the time blamed variations in solar activity. 08 Sep 1934 – Abnormal Weather. WORLD-WIDE DISLOCATION. “Scientist” used to mean what we now call “sceptic” – people who base their views on the evidence. These days Universities are so full of politically correct non-science that you really can’t liken modern “scientists” to the real scientists of old. Todays ‘scientists’ are the witch doctor, rain dancers of the past. Lull the dim-witted people to sleep with their impressive dance diversions. I know a few scientific scientist, they are not all one monolithic entity at all. I strongly agree that oceans and the sun are the two forces that influence/make climate, but, on the other hand, I also believe that human activities on the oceans and seas influenced them and, thus, the climate. Here are some studies of what had happened during the naval war and how this one had a big impact over the climate: http://www.2030climate.com/. Blaming human origin CO2 has ZERO quantitative basis even if CO2 causes some warming. About 95% 0f the total greenhouse effect is water so this accounts for 0.57 C deg of the total change. 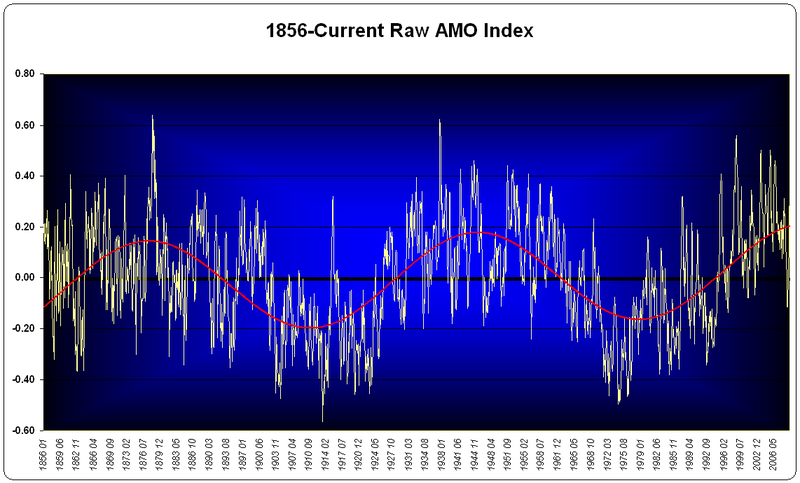 CO2, the other major player, is responsible for the other 0.03 C deg of Dangerous “Warming”. But, human origin CO2 is only about 4% of all atmospheric CO2 so the human input, if this mechanism was real, is 0.0012 C deg. We cannot even measure that change in temperature. Actually the influence on the ocean is the sun and the moon. This graphic is an animation (if it works right 😉 that shows how the point of the eclipse moves over the earth during a Saros series. That is also the point in direct alignment with the moon and sun, so ought to have the most direct tidal force. Various eclipses in each cycle and series. It is the net-net of all those wandering forces that stirs the world oceans. E.M. Takes a long hard look at moon/solar tidal forces on the ocean and the effects on weather. So not only is the data minipulated, adjusted, fudged, tortured and rigged beyond recognition by alarmists, the science behind the entire hypothesis is entirely flawed. Yet they have the nerve to threaten to use RICO against the skeptics! there is no man made warming. so any man made warming is an insignificant number. I went to post one of my favorite graphs showing the solar spectrum from colorado edu-sorce. Originally my book mark showed the graph. Then for the last year or so it went to a SORCE page. Now it goes to a different source page and has completely disappeared from the site. Not only has it disappeared from colorado edu, it has been wiped from much of the Wayback Machine! From 2014 (when I used it here at Steve’s) refers to the same useless site at SORCE. I did finally manage to find a copy on the Wayback Machine. Which brings me to the main point that Kent Clizbe and I were discussing earlier. NOAA/NASA and CLEAN are coordinating an effort to make sure there is NO INFORMATION except ClimAstrology not only in K through grad school but also on the internet!!!! This is frightening stuff folks. I knew ‘inconvienent’ information was being removed from the internet but I didn’t know it was a multi-million dollar concerted effort directed by NOAA!!!! So I poked around and found Isostasy and Postglacial Rebound “This resource is no longer officially part of our collection ….” refering to cleanet in the URL. Following up on CLEAN (“Climate Literacy and Energy Awareness Network “) from TERC, what do I find? NOAA! You have to see the interactive header to believe it! Gail, there doing it to Heating Degree Days also. The last four months have been some of the coldest you might ever recall in our lifetime. So far 2015 is the fourth coldest in Maine’s history over the last 120 years. Data from 2013 confirm that so far – from January 1 to April 29 – 2015 has required 4249 heating degree days. That rivals 1904, 1918 and 1923 over the last 120 years. But when I recently looked at NOAA’s revised 2015 data, these last four months now would not even put us in the top twenty of coldest months. The federal government went into the historical data and lowered those earlier years – and other years in the earlier decades – so that they can keep spending $27 billion a year on pushing global warming. They have done it to most of the temperature record. I used to show a graph of Norfolk City, a city on the North Carolina/Virgina border and right on the ocean, and the near by Norfolk International Airport as well as the Atlantic Multidecadal Oscillation. Norfolk City followed the same curve as the Atlantic Multidecadal Oscillation while Norfolk International Airport headed straight up with no sign of a curve. It was a really great example of UHI at airports. The Wayback Machine gives: Page cannot be crawled or displayed due to robots.txt. Now all that is available is Norfolk Naval Station starting in 1945.